I discovered something spectacular completely by accident. I was getting ready for the announcement of the discovery of the extra-solar planet Kepler-186 f. You remember, the Earth-sized planet in the habitable zone? It was all over the news (even in French) just a couple months ago. I made an animation of the Kepler-186 system. The planets went around and around on their orbits. The brightness of the star dipped every time a planet passed between Earth and Kepler-186 (the star). Animation of the Kepler-186 system. Each colored circle is one of the planets going around on its orbit. The green planet is the famous Kepler-186 f. The bottom plot shows how the brightness of the star dips every time a planet blocks part of the star’s light from reaching Earth. This is a planetary transit. That blip is deeper than the others. It’s got a weird shape too. It’s not from one planet blocking the light from the star, it’s from three! As seen from Earth (or really, from the Kepler space telescope), three planets pass in front of the star at the same time! A triple transit! They are the first-, second- and fourth-closest planets to the star. It would be nice if the habitable zone planet were one one of them. But hey, this is still pretty awesome! My friends that work on Kepler told me that a triple transit has already been seen (for example, in the Kepler-20 system). What would really be spectacular is if two of planets passed in front of each other while they were blocking their star. The shadow of one planet would fall on the other. A planet-planet eclipse! The view of the Kepler-186 star on June 15th. Each line shows the orbit of a planet passing in front of the star. Each planet is labeled (as either “b”, “c”, or “e”, meaning the first, second, and fourth-closest planets to the star). 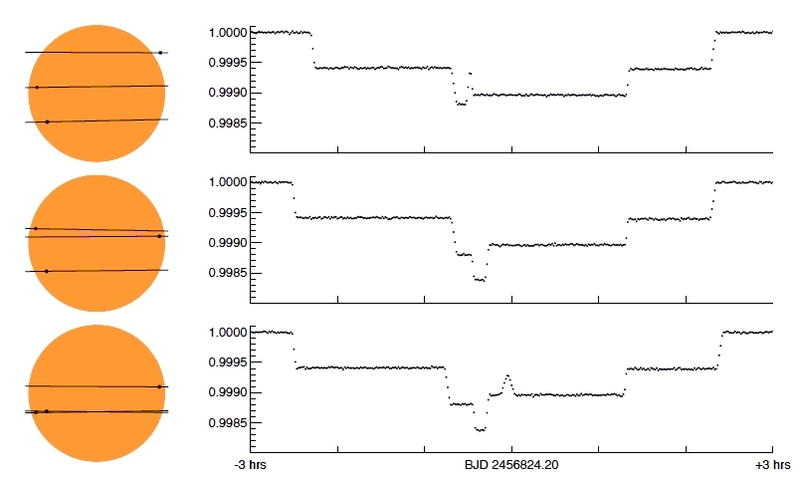 The bottom points show how the observed brightness of the star evolves. Planet c (second planet from the star) starts to transit first. Next comes planet e (fourth) then planet b. Planet b is closest to the star so it orbits fastest. It catches up with planet e and the two planets briefly overlap. This causes a short-lived increase in the brightness of the star. Instead of two separate planets blocking the star, during the planet-planet eclipse there is effectively just one. What’s so special about planet-planet eclipses anyway? They are powerful tools for studying the orbits of the planets. The shape of a planet-planet eclipse is one of the only ways to determine the inclination (the tilt) between two planets’ orbits. Among all the Kepler data only one clear planet-planet eclipse has been found. These are rare but extremely powerful. They are basically the Bengal tigers of astronomy! Now, we don’t know the exact path of each planet across the star. The animation I showed is for a lucky geometry. It turns out that there is about a 50% chance of a triple transit happening. If planet c’s path across the star is too high-up or low-down (if its “impact parameter” is too large) then it is already done before planet b’s transit starts. The planet-planet eclipse is a relatively low probability event. This is because the planets are so small compared with the star! You need a “lucky” setup for them to pass in front of each other. A planet-planet eclipse has just a 5-10% chance of happening. Well, there is never a super high probability of seeing a Bengal tiger except at the zoo. And astronomy takes place in the wild (believe me)! Still, a 5-10% chance of finding something historic seems worth a shot. Three possible transit geometries for the event on June 15th in the Kepler-186 system. In the top panel there is a double eclipse but no triple eclipse and no planet-planet eclipse. In the middle panel there is a triple transit but no planet-planet eclipse. In the bottom panel there is both a triple transit (lowest point of the curve) and a planet-planet eclipse (the small central bump). How could we observe this? The whole thing lasts about 6 hours. The triple transit — when all three planets are in front of the star — can last anywhere from not at all to an hour. The planet-planet eclipse (if it happens) only lasts about 10 minutes. The signal is small. Each planet only blocks a few ten-thousandths of the star’s light. We need to be able to detect a change in brightness of the star that is that small. And we need to do it fast, since some of these events may only last ten minutes! Plus, Kepler-186 (the star) is not very bright. So this is a very challenging measurement. There is only one telescope capable of making these observations: the Hubble Space Telescope. I put together a team of experts. People who know how to make this kind of observation happen. Some spectacular people: Avi, Brice-Olivier, Philip, Darin, Elisa, Tom, Franck, Jason, Daniel, Franck, and Emeline. There are a couple of issues that make the observation with Hubble tricky. First, the telescope has very little on-board memory. We want to carefully measure the brightness of Kepler-186 every minute or so. But there isn’t enough memory to store all the images. And downloading the images to Earth takes about 5 minutes, which would leave big holes in the signal. The solution was not to simply point the telescope at the star but rather to slowly drift past it. That way, the star’s light would be spread out across the camera (after being already passed through a “grism” to disperse it by color). Different parts of the chip would represent different times. The details of this were tricky but a couple of great observers (Avi and Brice) figured them out. Another problem is that Hubble orbits very close to the Earth. It is in low-Earth orbit. It takes about 96 minutes to go around the Earth once. Hubble can only see our target star when it is not blocked by the Earth. Unfortunately, the star spends almost half of each Hubble orbit out of view, behind the Earth. This leaves a 45-minute hole in the data. A planet-planet eclipse or triple transit is shorter in duration than the length of the observing window. So even if they happen, there is a 50/50 chance that Hubble would miss them. This is a bummer but there is no way around it. The bad thing is that it drops the chance of Hubble seeing a triple transit to about 25%. And the chance of Hubble seeing a planet-planet eclipse to 3-5%. I was really excited so we kept going. We wrote a proposal to observe Kepler-186 on June 15th. We couldn’t pass through the normal proposal process because this was happening so soon. Normally you have to propose to observe something (a star, galaxy, planet, …) up to a year in advance. I had only discovered the existence of this event in March! So we applied for special, last-minute observing time (“director’s discretionary time”). I sent in the proposal in early May. Drumroll ……… and a big frowny face. A week later someone at Hubble got back to me. They appreciated the proposal but did not award us any observing time. Bummer! Why didn’t we get the time? Well, I can understand their point of view. A triple transit is awesome, but we wouldn’t learn any more about the planets than we would from three separate normal transits. In some cases a precisely-timed triple transit could help figure out the planets’ masses (using the “transit timing variations” technique). But, Daniel found that the triple transit wouldn’t help all that much. Observing a planet-planet eclipse in the system would be spectacular. As I mentioned above, only one has ever been found before. And that was for bigger planets: a super-Earth and a Saturn-sized planet. The possible planet-planet eclipse on June 15th is for two roughly Earth-sized planets. Plus, it is in a very high-value system that includes a potentially habitable planet (and maybe another one). A planet-planet eclipse would tell us the inclination (tilt) angle between the projected orbits of planets b and e. This would be very interesting to know. A small inclination would tell us that the planets are located in a thin disk. But wait! Don’t we already know the answer? Well, sort of. There is only a small chance of ever finding a system like Kepler-186 with five transiting planets unless the planets’ orbits are confined to a thin disk. So, if Hubble saw a planet-planet eclipse it would almost certainly measure a very small inclination between the orbits of planets b and e. I can see how the Hubble reviewers may have thought that we would not learn anything really new. There are two strong counter-arguments to this line of thinking. First, we shouldn’t place too much faith in models. I mentioned that we think we already know the answer, that the planets’ orbits must be confined to a thin disk (like a Frisbee). But what if we are wrong? That’s not impossible. And it would actually be much more interesting if our guess was wrong. I think it’s worth testing. An inclined configuration of the Kepler-186 planets including a planet-planet eclipse. In this example, the orbits of the two planets that eclipse are inclined by almost 90 degrees with respect to each other! Although I think it’s unlikely, we cannot rule out that this is the true configuration. My second counter-argument is that planet-planet eclipses are just so so so rare! Among the tens of thousands of transits seen by Kepler, only one planet-planet eclipse has been found. Even a small chance (5%) of finding another seems worth going for. Imagine this: by going through a big nasty dumpster you have a 1 in 20 chance of finding a diamond the size of an apple. Would you do it? The odds are not great, but the potential payoff is spectacular. I would totally do it! Finally, the next triple transit in the Kepler-186 system won’t happen until the year 2047! I’ll be 70 and probably more interested in controlling things with my mind than in looking for transiting planets. Plus, I’m impatient. I don’t want to wait! In the end, I don’t blame the people at Hubble who decided not to implement our proposal. They have a very hard job. They get asked for 10-20 times more observing time than they can give. It’s not easy to decide who gets it. I am bummed about it, but I understand their decision. SUMMARY. This was a spectacularly fun project. I really enjoyed it. I learned all sorts of new things about transits and observing (and making animated gifs). I made some great contacts. I really went for it with the Hubble proposal. I did my best to make it happen. I thought we had a good shot at getting the observing time. But we didn’t get it. I’m disappointed but I feel good that I didn’t hold back. The main reason I am bummed is because I will never know if a triple transit or planet-planet eclipse happened on June 15. And no one else will either. UPDATE: After sharing this post, several colleagues told me that they thought that the triple transit might be detectable using a ground-based telescope (as opposed to space-based). My good friend Stephen Kane was able to secure the night of June 15th on a 2-meter telescope at the Indian Astronomical Observatory. This was the right longitude to be able to see the entire triple transit from a single location. Another drumroll…. and another big frowny face! Patchy weather. Bad seeing. No useful data. Bummer! Hi, really enjoyed your sixty planet systems and was wondering if double planets would show up in Kepler’s light curves, what would a world with a rocky ring system look like? I find it amazing that the earth-moon system barycenter is 1000 miles below are feet and that they have found huges oceans near that depth (New Scientist), could there be a connection? Good question. There are people trying to find exoplanet moons using Kepler light curves (e.g., the “habitable exomoons with Kepler” — HEK — project). The shape and duration of the transit of a binary Earth would be different than that of a single planet. But this is still a tricky detection — you would need a lot of transits. But if binary planets were very common very close to their stars they would probably already have been found. So, if they exist (I think they do!) they must be a little farther from their stars and/or include smaller planets. This makes sense as strong tides in star-planet-satellite systems can disrupt the satellite’s orbit. How small of a star can an earth sized planet be orbiting , when it is receiving the same amount of energy as the Earth receives, before it becomes tidally locked?